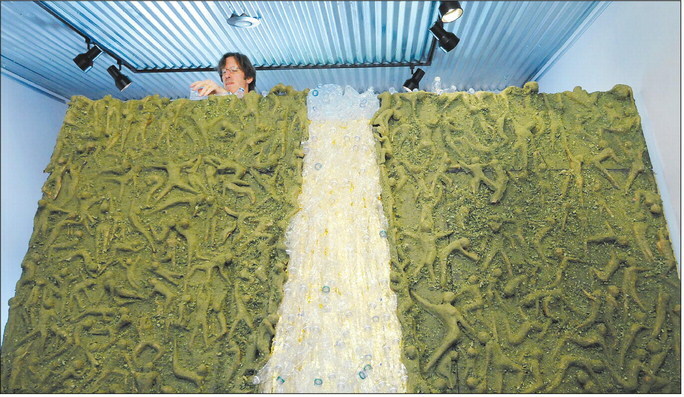 The water bottle crinkles between Doug Berky’s hands as he squeezes it, adds dollops of hot glue and puts it in place next to its brothers on the giant installation piece. The trail of empty bottles runs across the floor and up the wall, surrounded by sculpted figures of people. “There are some things words can’t do,” Berky said. “It would be hard for me (to do). What this image here reflects is a creative way of saying what is happening, what happens to peoples’ lives” The giant installation piece is part of Park Place Arts’ new exhibition, “Requiem for the Wapahani,” which opened Saturday and runs through Oct. 24. The show at Park Place Arts, 515 E. Eighth St., celebrates the natural beauty and historical heritage of the White River and serves as an act of protest against the Mounds Lake Reservoir proposal. As proposed, the project would dam the White River to create a 2,100-acre lake that would extend from Anderson to Yorktown. The project would cost an estimated $440 million. Proponents argue the project would create recreational and tourism opportunities, attract businesses and offer a water supply that will be needed in the future. But opponents — including Berky and Park Place Arts owner Eliot Reed — argue the reservoir will not hold water, will damage Mounds State Park and will have drainage issues. Reed said he decided in the spring to devote an exhibition to the White River and Mounds State Park. “What I would like people to take away is how the river affects people differently,” he said. The structure nearly touches the ceiling. The front is Berky’s interpretation of how people who live along the river will be affected. The other side consists of portraits taken by Reed of Irondale residents who will have to move if the reservoir is built. Reed said he walked through the neighborhood and knocked on doors to take photos, learn about the residents’ lives and to hear a firsthand account of what they stand to lose. “Requiem for the Wapahani” features more than 20 works of art from about 15 artists. It was the most geographically broad show Reed’s ever had, in terms of where submissions came from. The exhibition features work by artists from other cities such as Zionsville, Muncie and Indianapolis. Reed said the show has given other artists who aren’t as vocal about the reservoir project a chance to use their talent to express their viewpoints. Park Place Arts is open noon to 6 p.m. Tuesday through Friday, and 10 a.m. to 2 p.m. Saturday. Admission is free. Like Kelly Dickey on Facebook and follow her on Twitter @ KellyD_ THB, or call 640-4805.